T5 high-performance tube. 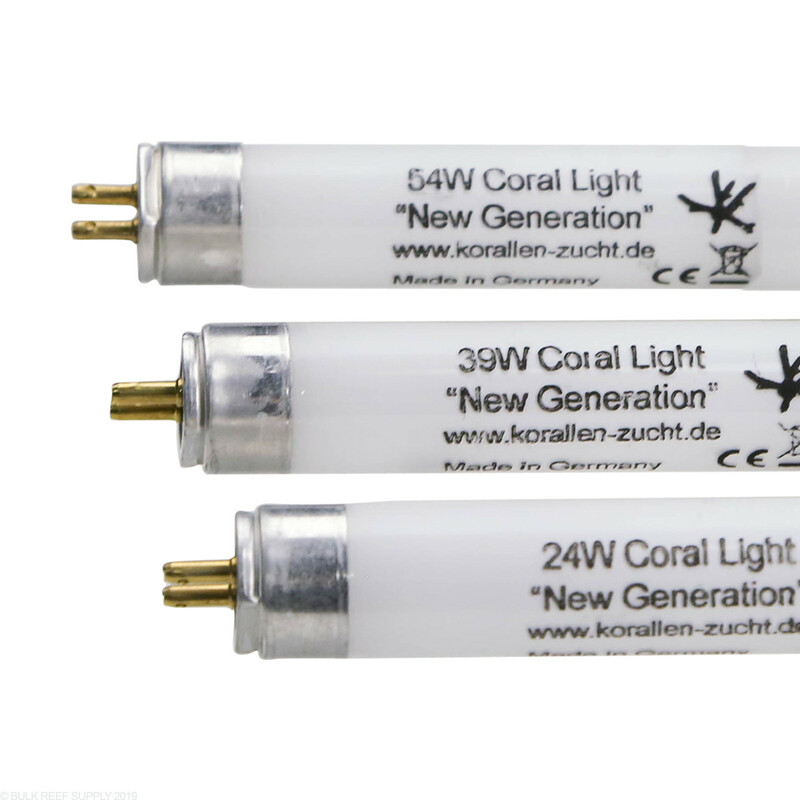 Long lasting bulbs with high-quality German Engineering. 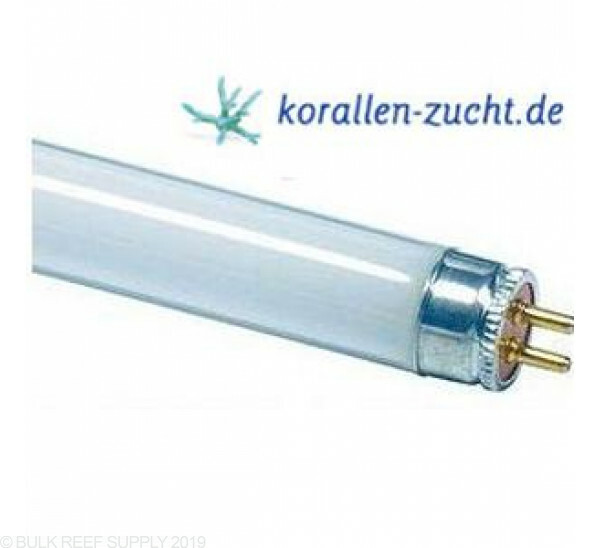 T5 Coral Light II New Generation from Korallen-Zucht makes an excellent mix of colors when used in conjunction with Fiji Purple and Super Blue. I replaced a giesmann aquablue coral which is a great whitish blue bulb with this, this is allot less blue , more white, kind of off white , which is still nice!! Replaced this 1 with a stock 10k & wow, love these. Also replaced stock actinic with super blue bulb & now corals looking vivid. Replaced the ATI aquablue special bulbs I used to use. These are way better. THey don't wash out as they age (they hold their blue color better) and my corals like them better (they keep their color better and grow faster). Simply, The best full daylight (Stand Alone) bulb I've ever purchased. The New generation is 14000K, and the old one is 10000K. The bluer bulb is a matter of choice for the color. You will have a decent growth with this bulb, but I personally prefer the 10000K. KZ bulbs are great and they are worthy the money! 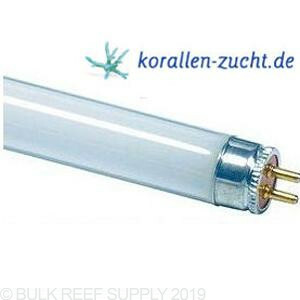 I want to try the Giesemann, but I've tried AquaticLife this year and I already can tell that their 10000K is the best looking of all bulb I've had. I use, like the old days, 3 actinic blue with 3 of their 10000K. I've been with ATI bulbs for many years and I aways try new ones to search and try to achieve better growth and health for my zoa tanks! Each combination will help you find more an more about the bulbs. Very blue to being with but once it burns in its very nice. All my coral seem to be enjoying it and it sure does brighten the tank. I use one of these with two blue+ and a purple+ on my 29gallon and it looks amazing and my growth has been notably quicker. I just sent a note telling you I need some new bulbs for my WavePoint HO T-5 48" light fixture. I am looking at this bulb product. on the Quick Overview it says "makes an excellent mix of colors when used with the Fiji Purple and Super Blue." I'd like to think that statement means my corals will love the excellent mix of colors and it is great for LPS and SPS as well as soft corals. And that it doesn't mean I will like the way it makes my eyes view the tank. And where is the Fiji Purple and Super Blue bulbs? How about a link from this page to those rather than make me have to go search since I need all three bulbs? Also I need FOUR bulbs so what 4th bulb should I add to those three to optimize the light in my tank? How about more info on these lights. Something that will make it easier to select in this case FOUR replacement bulbs for my fixture? You know what I would like is to have a worksheet where I enter my fixture, select the life stock in or will be in the tank, then have it recommend FOUR bulbs package options, show me the price of the different bulb mixes. At this moment I have no idea what bulbs will do best for my tank, not to mention what bulbs will actually work with my WavePoint Fixture. Great questions and ideas! Hopefully we will be abel to bring in some bulb packages to make navigation and finding correct bulbs easier. 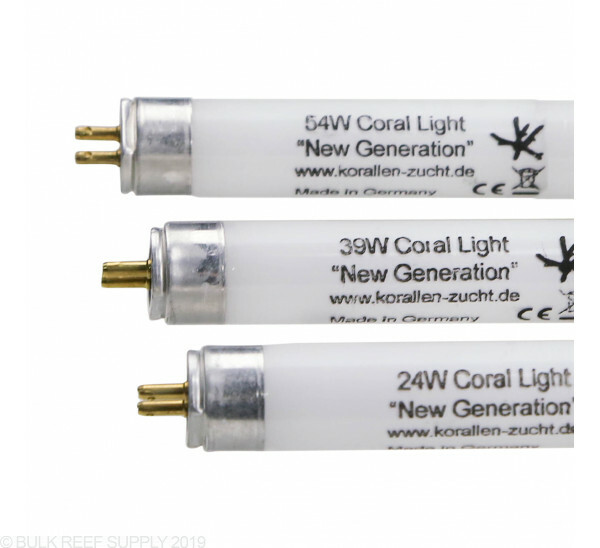 Currently the best option when choosing bulbs (for 4 bulb or larger is to buy most of the coral growth bulbs and 1 or 2 supplemental bulbs to make the color more appealing to the owner. This comes down personal choice in many cases as most bubs are designed for good growth and it depends on what color light you would like. Please feel free to email or call us directly if you have direct questions about bulb choices in the meantime!